(L to R) Ralph Affrunti, President, Chicago & Cook County Building & Construction Trades Council; Mike Stotz, President, AFL-CIO Investment Trust Corporation; Chris Kennedy, C.E.O, Joseph P. Kennedy Enterprises; Michael Carrigan, President, Illinois AFL-CIO; and Jorge Ramirez, President, Chicago Federation of Labor, all gather to cut the ribbon of the AFL-CIO Building Investment Trust's Wolf Point West. Chicago, IL (June 15, 2016) – More than fifty local labor leaders, politicians, and real-estate developers joined representatives of the AFL-CIO Building Investment Trust (BIT) at the BIT's recently completed project, Wolf Point West. Although tenants have already begun to fill the high-rise, a formal ribbon cutting was held just last month at Chicago’s newest luxury apartment. “When I walk through this building I feel an incredible sense of pride. It’s absolutely incredible that there are hundreds of men and women who were able to demonstrate what it means to be a professional craftsman while providing for their families,”* said Mike Stotz, President and Managing Director of the AFL-CIO Investment Trust Corporation. Wolf Point West is a 46-story multifamily project built in Chicago, and is the first completed out of the proposed three skyscraper Wolf Point redevelopment to Chicago’s central business district. Wolf Point West's total development costs are an estimated $162 million and it features 509 luxury rental units, market leading amenities, over 400 feet of publicly accessible river walk, and extensive green space. Initial occupancy began late last year, but the finishing touches were completed just in time to enjoy a spring view of the Chicago River. 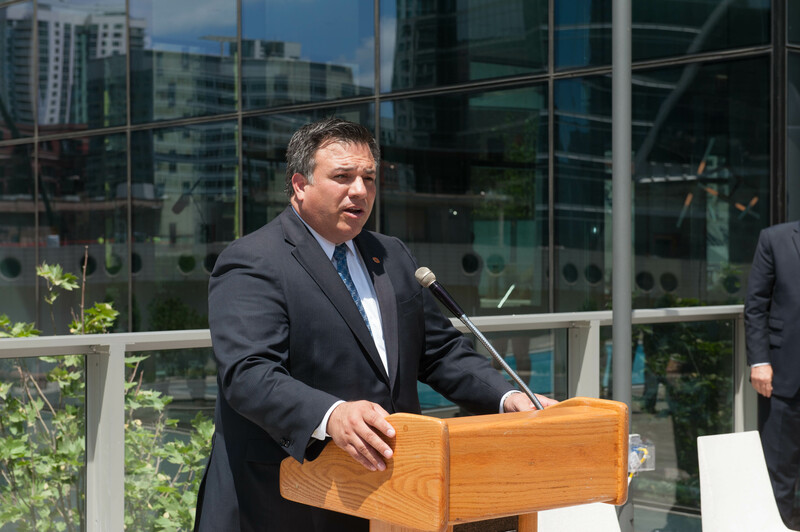 Jorge Ramirez, President of Chicago Federation of Labor addresses the crowd at the ribbon cutting of the AFL-CIO Building Investment Trust's Wolf Point West. “We are very proud that union job creation is advanced by the labor policies of the BIT. This Wolf Point development created hundreds of new jobs in Chicago,”* said Jorge Ramirez, President of the Chicago Federation of Labor. In the Chicago area, over the life of the AFL-CIO Building Investment Trust, the Fund has committed over $490 million for the development and acquisition of 19 projects, a total of more than 3,200 housing units and 3 million square feet of commercial real estate. BIT development projects in the greater Chicago area have totaled close to $1 billion in development costs and have created over 4100 union construction jobs. 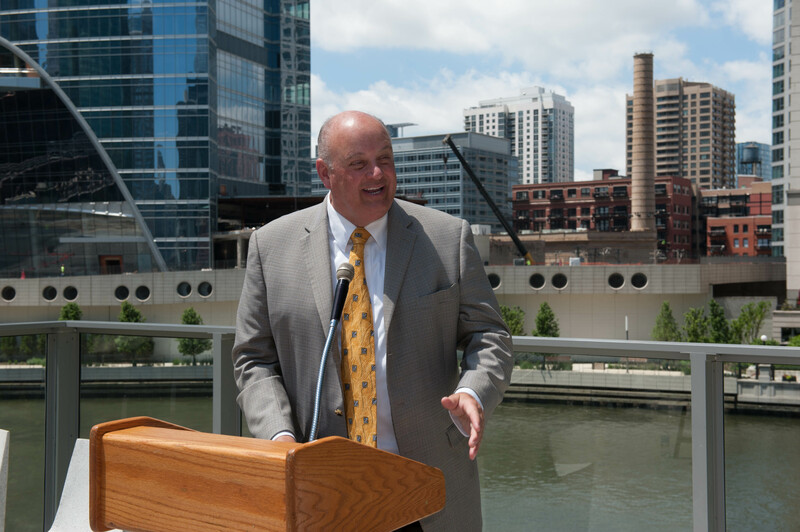 Michael Carrigan, President of the Illinois AFL-CIO addresses the crowd at the ribbon cutting of the AFL-CIO Building Investment Trust's Wolf Point West. “Wolf Point is another fantastic example of union pension dollars in action,”* said Michael Carrigan, President of the Illinois AFL-CIO. The BIT and its joint venture partner recently completed a 45-story apartment tower located at 500 Lake Shore Drive (located one block from Chicago’s famed Navy Pier), representing $157 million in total development costs that helped to create approximately 750 union construction jobs. It has 44 stories, 500 units, and 430 parking spaces. Ralph Affrunti, President of the Chicago & Cook County Building & Construction Trades Council addresses the crowd at the ribbon cutting of the AFL-CIO Building Investment Trust's Wolf Point West. “It is very encouraging to see union pension dollars put to work through investment in the BIT. 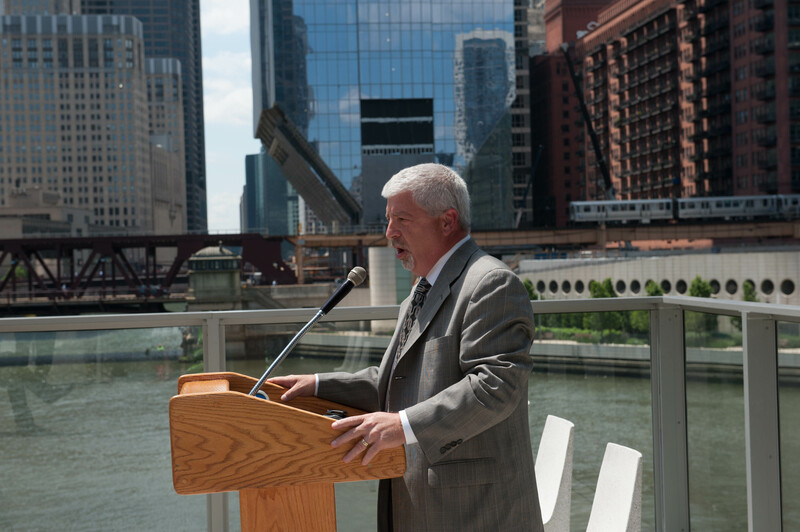 Wolf Point is a development that workers in Chicago can be proud of,”* said Ralph Affrunti, President of the Chicago & Cook County Building & Construction Trades Council. Over the BIT’s 28-year history, the fund has invested more than $6.2 billion for the development and acquisition of more than 200 retail, office, multifamily, hotel, warehouse, and mixed-use properties across the country. 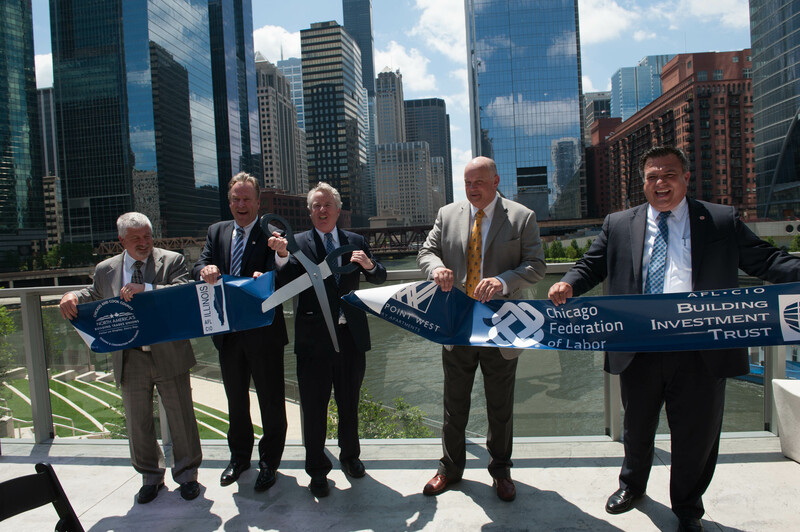 The event was attended by representatives from the Illinois AFL-CIO, the Chicago Federation of Labor, the Chicago & Cook County Building & Construction Trades Council, the AFL-CIO Building Investment Trust, PNC Realty Investors, Inc., Hines, Magellan Development Group, Wolf Point Owners, and the AFL-CIO Investment Trust Corporation. *Opinions of third parties are not representations, warranties, or opinions of PNC Bank, National Association, trustee for the BIT. The BIT was managed by a trustee unaffiliated with PNC Bank from July 1, 1998 through December 31, 1991, and PNC Bank is relying on data provided by this prior trustee for this time frame. The AFL-CIO Building Investment Trust (the “BIT” or the “Trust”) is a bank collective trust for which PNC Bank, National Association (“PNC Bank”) is the trustee. PNC Bank is a subsidiary of The PNC Financial Services Group, Inc. (“PNC”). PNC may use the service mark “PNC Institutional Asset Management” in connection with certain activities of the Trust. PNC Bank has retained PNC Realty Investors, Inc. (“PRI”) to provide real estate investment advisory and management services, and the AFL-CIO Investment Trust Corporation (the “ITC”) to provide marketing and investor and labor relation services, in connection with the BIT. PNC Bank licenses the ability to use the “AFL-CIO” name in the name of the Trust and in connection with the activities of the Trust. A participant’s investment in the BIT is not a bank deposit, nor is it backed or guaranteed by PNC or any of its affiliates, and is not issued by, insured by, guaranteed by, or obligations of the FDIC, the Federal Reserve Board, or any government agency. Investment in the BIT involves risk. Investment return and principal value of an investment in the BIT will fluctuate so that a participant’s investment, when redeemed, may be worth more or less than the original investment. A participant’s redemption of its investment or units in the Trust, or a portion thereof, may be delayed by Trustee for one year (or longer if permissible under applicable law) from the date of the request for such redemption. The BIT generally invests directly or indirectly in commercial real estate through equity investment and occasionally through the provision of financing. Equity investments are subject to risks inherent in or customarily associated with the ownership of income-producing real estate, and real estate financing involves risks inherent in or customarily associated with the risks of financing secured directly or indirectly by income-producing real estate. Due to such inherent risks, investment returns can be expected to fluctuate and operating cash flow and the Trust's ability to make redemptions or distributions could be adversely affected. Moreover, due to the nature of real estate, investments may be illiquid. Such liquidity may affect the Trust’s operating cash flow, which, in turn, may delay the ability to satisfy redemption requests. Additionally, the BIT or its investments may obtain financing. Such investments are subject to the inherent risks arising from the use of financing, and such risks may increase volatility of a fund’s performance and may increase the fund’s losses. The information contained in this material is not intended to be a comprehensive description of any investment product or capability. Neither the information herein, nor any opinion expressed herein, constitutes an offer to buy or sell, nor a recommendation to buy or sell, any security or financial instrument, including an interest in the BIT, and is not intended to serve as a primary basis for a decision with regard to whether to invest in any security or financial instrument, including an interest in the BIT. Investors in, or potential investors of, the BIT should consider carefully the BIT’s investment objectives, risks and expenses before investing therein. Investors should consult their own advisors and investment professionals to evaluate the merits and risks of investment. Except as otherwise disclosed, the materials, representations and opinions presented herein are those of PNC Bank, and are of a general nature and do not constitute the provision by PNC of investment, legal, tax, or accounting advice to any person. Opinions expressed herein are subject to change without notice. The information was obtained from sources deemed reliable. Such information is not guaranteed as to its accuracy. Information contained in the material above herein regarding or providing past performance should not be considered representative, and is no guarantee, of future performance or results. Forward looking statements contained in the material above involve certain assumptions, including but not limited to the performance of the real estate market, which could cause actual outcomes and results to differ materially from the views expressed in the material above. For more information regarding the investments, risks, and expenses of the BIT, copies of the latest investment memorandum and the applicable plan documents for the BIT, including the trust agreement and a form of participation agreement, may be obtained by contacting 855-530-0640 or BITTrustOfficer@pnc.com. Please read the investment memorandum carefully before investing in the BIT. PNC does not provide legal, tax or accounting advice and does not provide services in any jurisdiction in which it is not authorized to conduct business. PNC Bank is not registered as a municipal advisor under the Dodd-Frank Wall Street Reform and Consumer Protection Act. Not FDIC Insured. No Bank Guarantee. May Lose Value. For Institutional Use Only- Not for Use with Retail Investors.